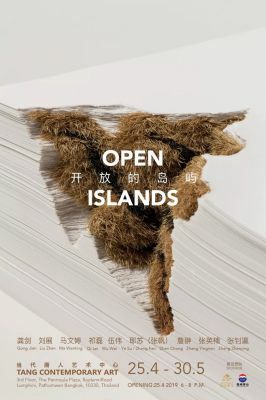 Tang Contemporary Art Bangkok is proud to announce the opening of the group exhibition “Open Islands” on April 25, 2019. The exhibition will presentpainting and installation works by nine young Chinese artists: Gong Jian, LiuZhan, Ma Wenting, Qi Lei, Wu Wei, Yesu (Zhang Fan), Zhan Chong, Zhang Yingnan, and Zhang Zhaoying. The work of every one of these artists is an island of recollection, experience,and feeling. Due to their different experiences, these artists have createddisparate modes of existence and story telling. The Square Space series of paintings by Yesu(Zhang Fan) captures impressions of everyday life. He selects hanging lamps, animated characters, and domestic scenes from his childhood, and by copyingthem and reshaping them, he separates psychological narratives from everydayscenesand emphasizes the internal experiences of aperceptive individual. Qi Lei’srecent work depicts laboring people in outdoor settings. Everyday scenes set againsta background of purplish-red trees takeon an unreal quality. With his obscurepainterly language, he expresses existence as stumbling along in the rush ofreality, recounting his own internal anxieties and those of other people. Ina developed industrial society, products become forces that control everythingin life, and the individual exists to consume. People are immersed in fantasiesof materialgains, and in the course of competitions and transactions, theyexploit themselves and become possessed by material things. People’s true needsare engulfed by consumerism, and people become increasingly estranged from oneanother, feeling the threat of absurdity, emptiness, and ambiguity in thebottom of their hearts. A materialistic, alienated world places these pressures onhumans, and the work of artists cannot escape reflecting on real issues. Ma Wenting’s work draws on the pictures that permeate our society. She juxtaposesand layers representational images and abstract, geometric blocks of color, dismembering reality by throwing perspectival principles and spatial relationships into disarray. These juxta positions of entirely unrelated imagesbecome seemingly real visions that also contain a good dose of irrationality. Byinserting and entangling objects, she contrasts and minglesthe truth andabsurdity in our realities. The memories and life experiences of moving aroundthe city as a child are the creative inspiration for Zhang Yingnan’s work.Heuses minimalist, massive, and cold modern architecture to reflect his feelingsas an individual existing in society. The spaces overwhelm the figures,highlightingthe estrangement, isolation, myopia, and unease of the crowded lives common in moderncities. These nine artists begin from personal experience, affirming the value of their memories and perceptions. The exhibition reveals private emotions and reflections on society, transforming them into memories shared with the viewer. This exhibition specially thanks to Kweichow Moutai Thailand Distributor-Siam Dragon (Asia-Pacific) Co., Ltd.